Rosin Cerate: Breathing Bordeaux is entirely different from drinking it! Breathing Bordeaux is entirely different from drinking it! It was the summer of 1882, and grape farmers in the Médoc region of southwest France (north of Bordeaux, on the Atlantic coast) had a problem. Schoolchildren (or university students, or just anyone travelling the roads along which the grapevines grew, depending on what source you're reading) were pilfering their grapes. To try and ward them off, some farmers decided to dissolve some slaked lime and copper sulfate in water and spray it on their grapevines closest to the roads. The idea was the bright blue-green colour and unpleasant taste of the mixture would make the grapes less appetizing to thieves. While it's not clear how successful this approach was, it enabled a professor of botany from the nearby University of Bordeaux to make a really useful observation: the blue-green mixture was great at preventing the growth of downy mildew (Plasmopara viticola), a fungus-like organism (oomycete) with an appetite for grapevines. Vines sprayed with the mixture (which came to be known as Bordeaux mixture) were not affected by the mildew, which was pretty rad if you were trying to grow grapes for a living! Bordeaux mixture came to be used worldwide to prevent the growth of crop-eating fungi and oomycetes. Lots of produce was spared from microbial attack and so made it into the kitchens of the world thanks to the blue-green liquid. Unfortunately, there's a dark side to the use of Bordeaux mixture. First of all, since copper is a metal and so doesn't break down in the environment, each time you spray a field of crops with Bordeaux mixture you end up with more copper in the soil. Although copper is an essential nutrient, you don't need a whole lot of it. At higher doses it becomes toxic. Lots of copper in a soil means everything hanging out in that soil doesn't do as well. It's bad news. Another issue with Bordeaux mixture is the need to have someone spray it onto crops. If they're not using proper protective equipment, whoever does the spraying usually ends up breathing in lots of spray. Turns out inhaling a bunch of copper isn't great for your lungs. 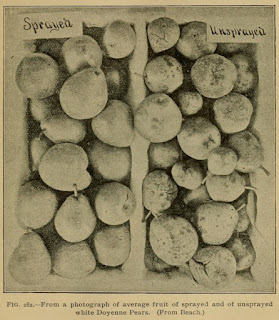 As the use of Bordeaux mixture continued and spread around the world, people employed to spray it on crops began complaining of lung problems. Their symptoms were consistently misdiagnosed, usually as tuberculosis, until the late 1960s. 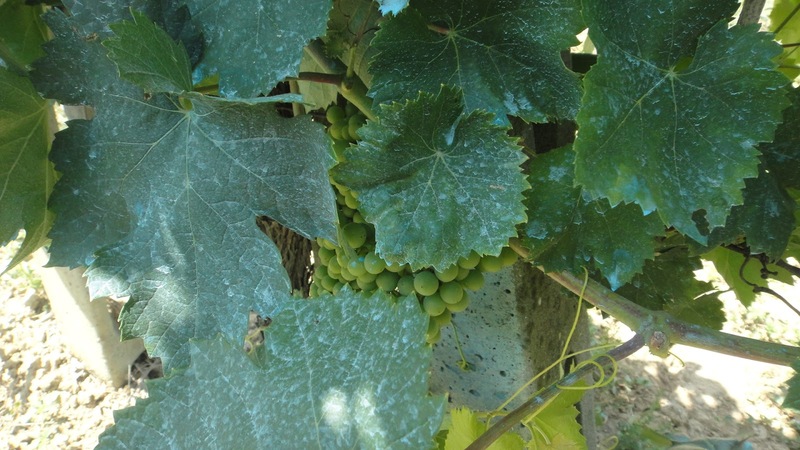 At this time, medical researchers in Portugal (Portuguese winegrowers had decided to stick with Bordeaux mixture instead of replacing it with newer fungi-killing pesticides) decided to take a look at the situation. Looking at grapevine sprayers who had recently died, they realized most of them didn't actually have tuberculosis even though their lungs were heavily damaged. The damage was comparable to the black lung disease seen in coal miners, only the lungs of sprayers were stained blue by the copper they had inhaled instead of being blackened by coal dust. Looking at the living, Portuguese researchers found sprayers often had lung fibrosis (scarring of the lung tissue due to long-term inflammation, making it difficult to breathe), which worsened with time and eventually resulted in advanced lung disease. Lung fibrosis is also seen in coal miners and those working with silica. In the end, you can't breathe well enough on your own to get enough oxygen and can die from respiratory failure. It's a horrific illness, particularly since it's so often preventable. To top it all off, sprayers of Bordeaux mixture were found to be more likely to develop lung cancer. The lung disease came to be known as "vineyard sprayer’s lung" and was found to be common among career sprayers. They only sprayed for a couple of months every year, but this was enough to inflict lasting and eventually fatal damage to their lungs. Copper also made its way to their livers, where it caused fibrosis and other types of damage. Decades before Portuguese researchers decided to take a closer look at the copper-coated lungs of vineyard sprayers, employees on banana plantations were being exposed to even greater amounts of Bordeaux mixture. In the mid-1930s, a fungus by the name of Mycosphaerella musicola made the jump from the South Pacific to the Caribbean and Central America. 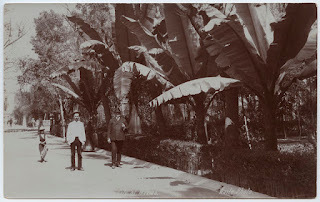 M. musicola is responsible for a disease of banana plants called yellow sigatoka, named for the Sigatoka Valley in Fiji where it caused major destruction earlier in the century. It damages the leaves of the banana plant, diminishing its ability to carry out photosynthesis, which in turn reduces how many bananas the plant produces and causes the fruit to mature early. In response to a growing yellow sigatoka epidemic, the United Fruit Company set up an incredibly intense spraying operation to deliver, every two weeks for the entire year, 250 gallons of Bordeaux mixture to every acre of banana plants. Central facilities pumped the mixture through miles of metal pipes to which workers attached hoses to spray it on the plants. Unlike the vineyard sprayers in Portugal, banana sprayers worked year-round. Furthermore, because banana plants grow up to forty feet in height, and it was necessary to treat both sides of each giant leaf, workers (who lacked any sort of effective protective equipment) spent a lot of time looking up while spraying the plants. This meant they inhaled, and ingested, and absorbed through their skin, a hell of a lot of Bordeaux mixture. It accumulated on their faces, arms, legs, and clothing, staining them a blue-green that persisted even after scrubbing with soap and water. Sprayers were nicknamed pericos (parakeets) after the colouration they shared with these birds. Bordeaux mixture permeated their bodies to such an extent that ex-workers reportedly produced slightly blue-green sweat for months after leaving the job! It's very likely many of the thousands of people employed as pericos ended up with serious lung damage, probably misdiagnosed as tuberculosis. The intensive Bordeaux mixture spraying approach continued until the early 1960s, well before researchers in Portugal realized just how dangerous Bordeaux mixture was. It's a tragedy no one connected the dots prior and did something to protect the workers.